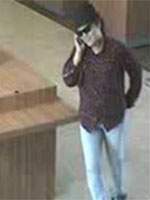 The Orange County Bank Robbery Apprehension Team (BRAT) is seeking assistance from the public with information leading to the arrest of a suspect known as the Chubby Cheeks Bandit, an unidentified female bank robber who robbed a Chase Bank at 4:30p.m. on June 17, 2013. The bank is located at 1300 North Main Street in Santa Ana. During the robbery, the suspect demanded cash from a victim teller, exclaiming, “Give me your money. I need money.” The suspect is described as a white female in her late 20s, 5’3” tall, 170 lbs., with what witnesses described as chubby cheeks. 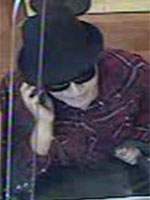 During the robbery on June 17th, the suspect wore a checkered shirt, light jeans, a hat, and sunglasses. Bank surveillance photos are above.